This metal loft bed with work station embraces both trend and functionality. With a built-in desk and corner shelves, this all-in-one unit is a terrific space-saving solution for smaller living spaces. The metal loft bed with work station creates a sense of privacy and provides a quiet spot to study or relax. Abode Full Metal Loft Bed Over Work Station: Designed for smaller spaces Silver frame with black desk and shelves Desk and shelves offer ultimate versatility Two ladders, one front and one side, along with upper guardrails for added safety All-in-one unit accommodates one full-sized mattress (not included) Weight capacity: 300 lbs. 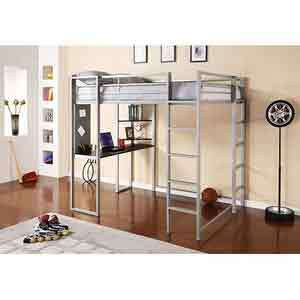 Metal loft bed with work station requires assembly. Available in Silver or Black.